Wash the cabbage and the carrots. Thinly slice the cabbage leaves. Peel and thinly slice the carrots and the onion. Cut 3 slices of bacon into thick lardons, leaving the other 6 whole. Bring a large pan of salted water to the boil and then add the cabbage to the pan. Cook until tender and then refresh in cold water. Prepare the quails, reserving the giblets, tips of the wings and the necks for the sauce. Season the quails with salt and pepper and then wrap with a slice of bacon. Heat the oil and then colour the quails on all sides. Once lightly golden brown, remove the quails from the pan and place on a baking sheet. Drain any excess grease from the pan and then add the quail giblets, wings and necks to the pan. Add the onion, carrot, garlic thyme and the bay leaf to the pan. Sweat over a low heat and then deglaze the pan with the white wine. Simmer until the white evaporates and then cover with water. Simmer for a final 20 minutes. Season with salt and pepper and then transfer to a sieve or colander. Drain the liquid back into the pan and reduce by half. Heat a frying pan and add the lardons, cook until golden brown and then add the cabbage. Reduce to a medium heat, cover and cook for 10 minutes. Remove the lid and cook until the liquid evaporates. Place the quails in the oven and cook for 10 minutes. 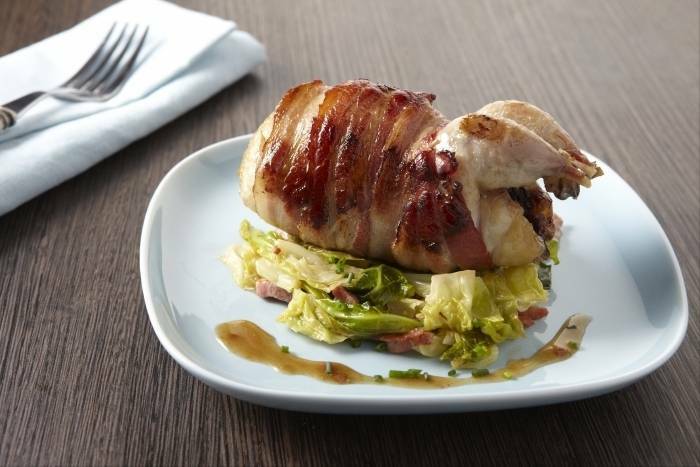 Serve the quails on a bed of savoy cabbage and dress with the sauce. Sprinkle with chopped chives to finish.